I, the anonymous baker supreme, have had an inspiration. Quarken Xired must have needed much energy for all of the adventures he has taken. Thinking about it I came up with a set of trail rations that he could have used on his travels. Simply mix black strap molasses, mammoth steaks, frost giant steak, hobgoblin surprise, dried cragbeast meat, grilled darkhollow basilisk jerky, grilled treant vegetables, grilled minotaur meat jerky and two three oak acorns. Bake until it crumbles into a nice mix that you can snack on. 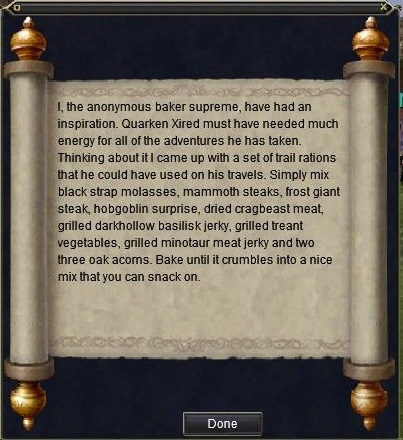 This book contains the instructions for making Quarken Xired's Timeless Trail Rations.